Having taken the challenge to revise my use of virtual learning environments over the last half term I thought it was about time for an update. Having used Edmodo as a space where students can be set homework or interactive classwork, it was surprising how quickly the students were able to adapt to using the new technology. One of the main issues with the old VLE was that information really only went in one direction, from the teacher to the student, and was limited to chunks of text or links to websites. 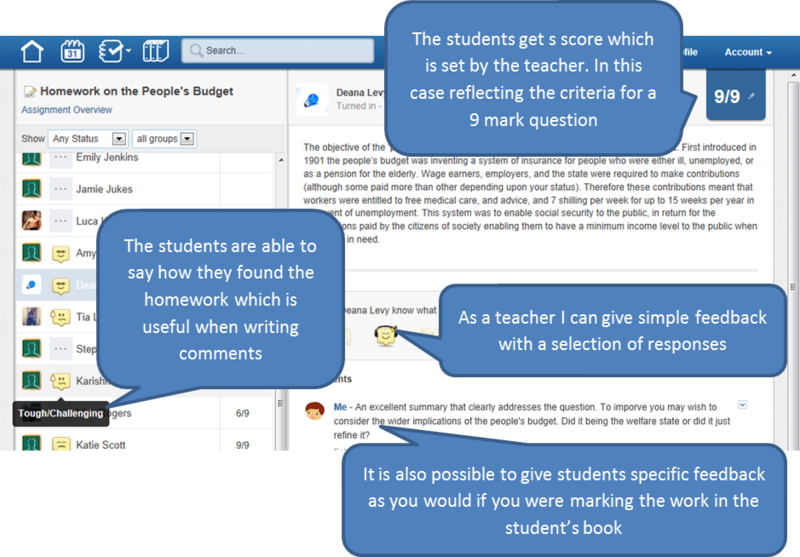 Edmodo allows the students far more opportunity to comment on the work they are set and for teachers to give feedback on completed assignments. Below is an example of students explaining what they thought the assessment was like and my comments and feedback to them: All helpfully shown on a single page. 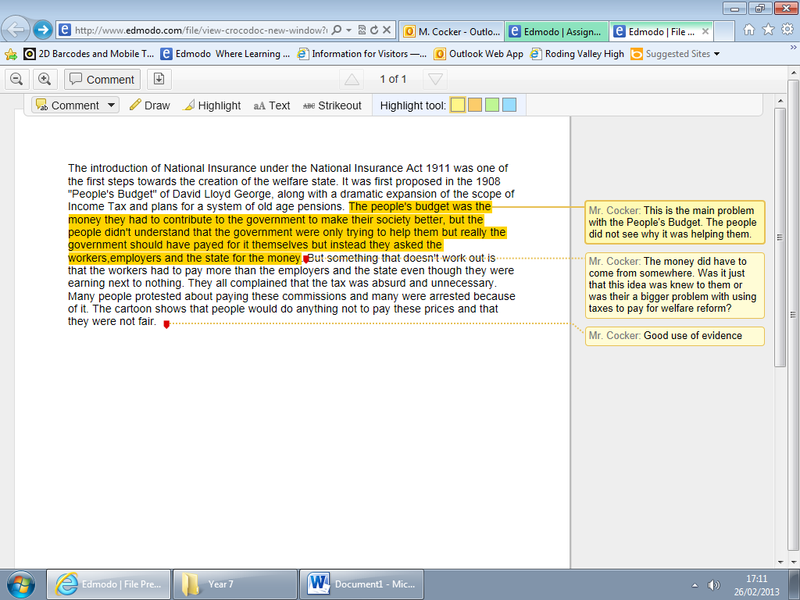 students work can be annotated with tools which are at the top of the screen. Although, some students are still finding their feet with this way of working it has provoked discussion and allowed students access to a range of resources that they would not otherwise have found. I am still a long way from using Edmodo with all my classes or even every week with classes. However, if we expect students to feel confident in a world where many jobs require social media skills it is necessary to challenge both ourselves and students to engage with their school work online, at home and at school. Students participate in e-safety learning for safer internet use. See below for presentation with advice and tips as shown to our students in a week of assemblies. I was asked by my group of NQT’s….Can you give us some simple but practical ways to improve our teaching and in turn enhance the learning ? Create thought provoking starter activities (the hook ) – have it ready as soon as they arrive on the desk/whiteboard – get them to start as latecomers arrive. Use tiered / progressive learning objectives: maybe colour coded to help students realise progression from green to orange to red means difficulty increases. Use learning objectives not task based objectives. Have mini-whiteboards on the desk most lessons-even if you hadn’t planned to use them, you might find them invaluable when you have to re-model a task and think on your feet. Take all opportunities for self and/or peer assessment / marking – use a web cam/visualiser show student work during the lesson and ask for feedback, positive and next steps learning. Model exemplar pieces but also show common misconceptions. Make sure any resources are creative but don’t get lost in them, focus on the learning. Avoid getting students to copy out definitions/key information- get them to work for this information themselves. Use different types of activities from lesson to lesson – aim to keep students on their toes each lesson so they do not know what to expect. Re-model tasks verbally to help differentiate – you can verbally scaffold tasks for individual students without having to have 5 zillion different worksheets. Ensure that you speak to every student in the room at least once during a lesson (say hello, ask them a question, praise them, comment on their work). Ask probing, open-ended questions – ask them to the students without their hands up- even better- apply a no hands up policy from time to time. Be consistent with behaviour rules/discipline with every student in the class. Always have an extension task or two ready – students should never sit idle. Ensure that you complete a plenary, make sure you know which students have achieved the learning objectives. I was quite pleased with these. practical tips and presented them to the assembled NQT’s. 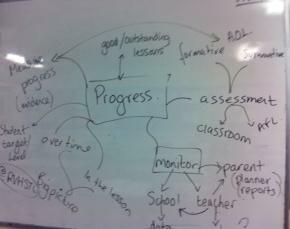 We then discussed the importance of the phrase ‘progress over time’ and its implications for us in the classroom. This led us into the importance of marking and effective feedback to the students. We discussed how it was no longer possible to achieve good /outstanding if your feedback and marking did not equip your students with the means to improve and make progress over time. We are currently writing up some examples of best practice marking and methods at Roding Valley High School and these will be published soon. Computer/video games have no place in education. Or do they? For the past year students in my upper school lessons have been using the Zondle service to support their learning. Zondle can be summarised as a web-based platform that allows students to learn/check their understanding through playing games. Zondle engages my students really well and the fantastic mobile app means many of my students can use the service whilst commuting or sitting in front of the TV. It takes learning out of the classroom into a fun addictive portable format. Zondle works by allowing teachers to create question sets which are then transformed into an interactive activity. When students log on they are able to see what topic(s) they have been set and are then presented with a vast range of games which incorporate the question set. Activities available include the very popular penalty shoot-out egg catching in battery chickens through to pizza baking. Gameplay tends be addictive as the system makes good use of gamification techniques such as collecting Zollars. Students can also see the progress of their classmates which motivates them further to be the best. As a teacher I am able to access an automatically created mark book which enables me to monitor progress of students and identify areas for intervention. I am also able to add some challenge into activities by declaring my high score on different games – this seems to really motivate them to beat me. Of course in the process of playing the games they have to answer questions correctly and are therefore re-enforcing what they have learnt and hopefully developing their memory of the concepts. At the end of the Autumn term, one of my classes was set the task to create multiple choice questions for Zondle. There were some teething problems at the time but I would like to do this again. In allowing students themselves to author the questions, they are able to demonstrate higher order thinking along Bloom’s taxonomy whilst also being given a platform to share their work across the Zondle community. An example of the Zondle markbook. One of the games on Zondle involves catching eggs. Answer questions correctly in order to decorate your pizza. Answer questions correctly in order to take a penalty. Trial run MinecraftEdu to further assess the usefulness of game based learning for our students.